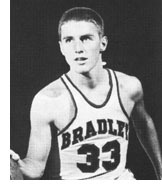 Bob Carney was one of the finest guards in Bradley basketball history and paced the Braves to a second place finish in the NCAA tournament. His 23 free throws against Colorado in a single game and his 55 free throws in the NCAA Tournament are tournament records which have never been broken. 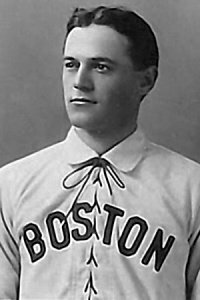 Carney was an All-State performer in Aurora before coming to Bradley. At Bradley he scored 1,355 points for a 15.5 career scoring average. Both figures place him among the top ten in Bradleyís illustrious cage history. He was also a brilliant passer and playmaker and also led the team in assists. His all around play and leadership were most apparent in the NCAA Tournament in which the Braves caught fire after a 15-12 regular season. He led the team to victories over highly regarded Oklahoma City, Colorado and Oklahoma to bring Bradley to the final four. He then paced the Braves past Southern Cal to qualify for the championship game. Despite an outstanding performance by Carney, Bradley lost the NCAA title to LaSalle and All American Tom Gola, 92-76. Carney was selected to the All Tournament and All American teams.